IRREGULARITIES WITH THE COMPULSORY PURCHASE ORDER. The Council doesn't own the land for the turning circle. They would have to compulsory purchase it. They could have included this land in the compulsory purchase order but they made a deliberate decision to exclude it. 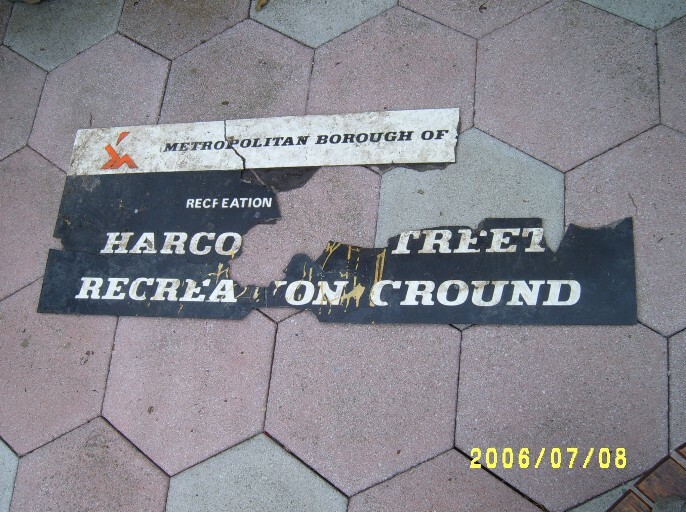 It would have led to a public inquiry given the size of the public open space to be taken. There would have been uproar from local residents, as no-one ever wanted that school to go where it did (except councillors and council officers). This means that in order to implement the safety solution to a problem they themselves identified at the planning decision meeting, they would have to embark on a long, long legal process which would be bitterly opposed by local residents. When the first child dies in a road accident there, my belief is there are very strong grounds for corporate manslaughter charges to be brought against the Chief Executive Eamonn Boylan. No-one's child should die in the cause of a nice little earner for Stockport Council. The Council misled the Secretary of State, saying they had received no objections from anyone who thought they had an interest in the land. They had received a Statutory Objection from a houseowner who felt he had had an interest in the land for decades. This meant no public inquiry was held into the compulsory purchase order, which the Council was terrified of holding as they problably would have lost. 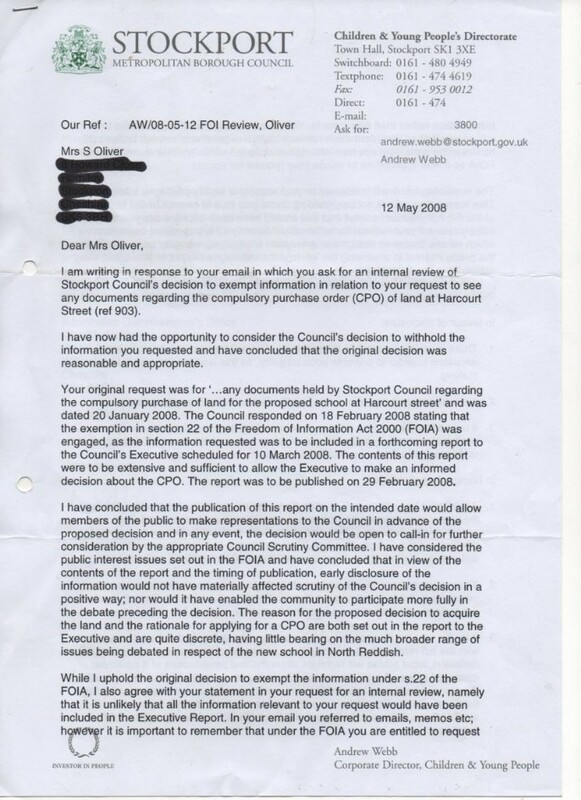 Stockport Council breaks the law and defames people who try to expose what they have been up to by branding them "vexatious" and a waster of public money. "The Fraud Act 2006 defines fraud as activity aimed at securing a gain, causing a loss or exposing somebody to a risk of loss, through false representation, failing to disclose information or through abuse of position. Crucially under the new Fraud Act, no gain or loss actually has to happen for a fraud to occur, the act of fraud is entirely defined by the actions or intent of the individual." 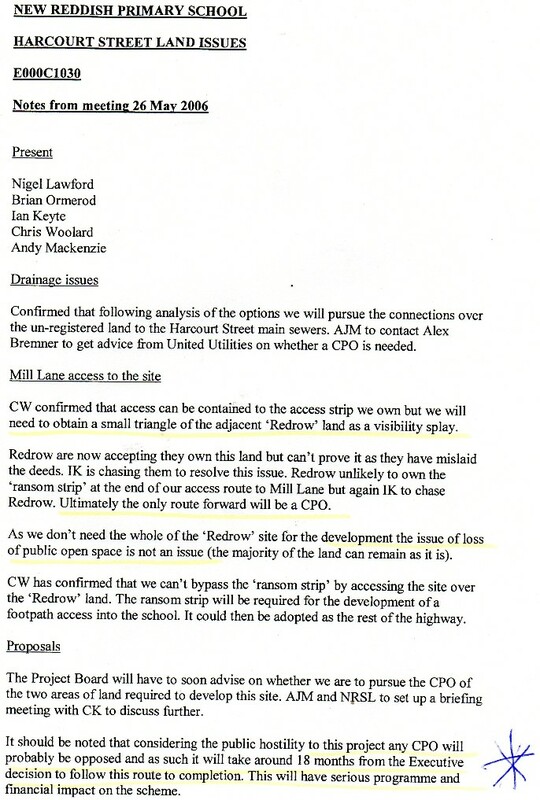 Above they mention the public hostility to any compulsory purchase of much-loved open space. By law they had to hold a public inquiry, which they knew they would lose, so they simply didn't bother. 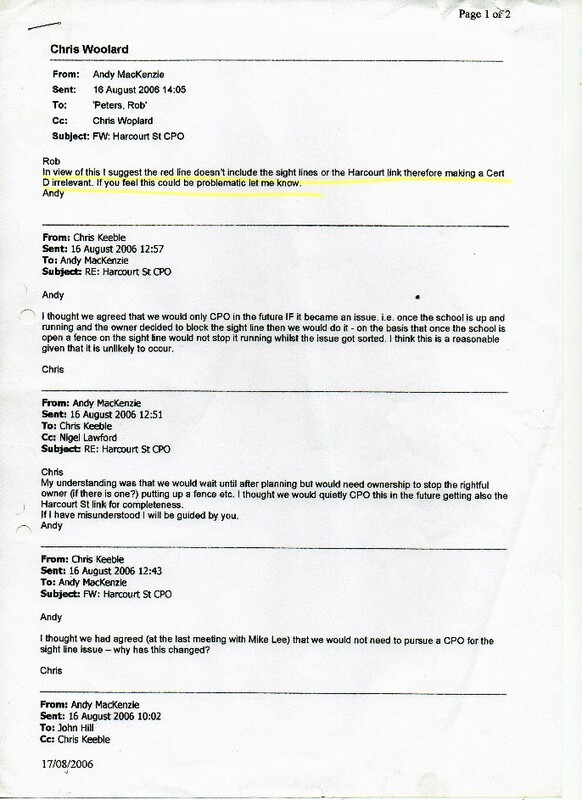 "Quietly CPO this..." And that is what they did denying local people their legal right to a public inquiry, which the Council knew it would lose. So, they simply broke the law and didn't hold one. Concern about an "eagle-eyed" landowner spotting he was being fleeced by this council. 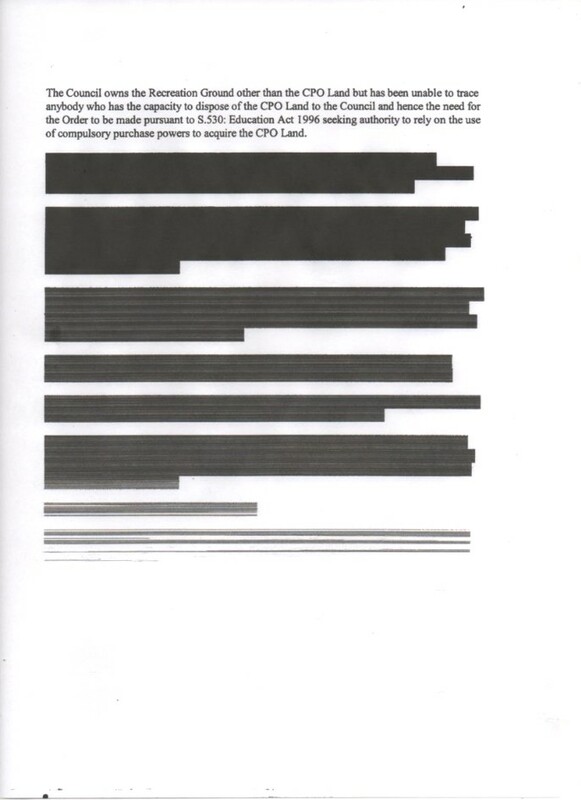 This document was heavily redacted by Stockport Council. You should receive a full response to your request for an internal review early this week. 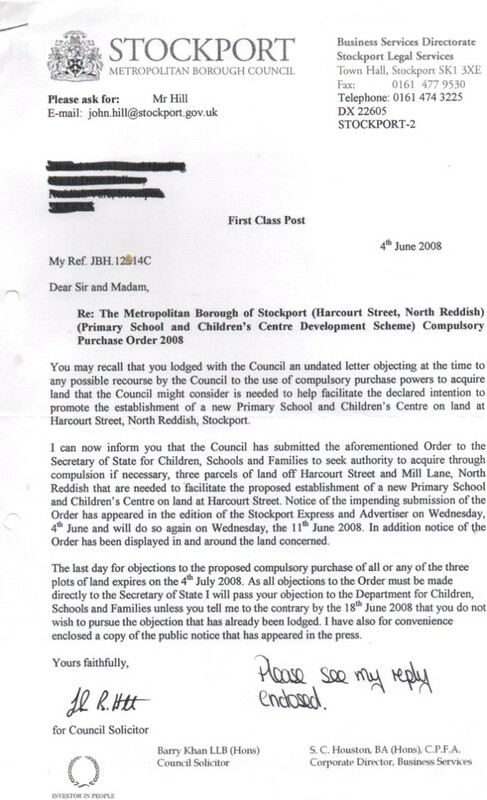 I note I have not yet received the independent internal review of SMBC's refusal to let me see background documents regarding the Harcourt Street CPO. This was promised to me in February and Listening Dave, the Leader, also promised I would receive it in the full council meeting. When will I be getting this? 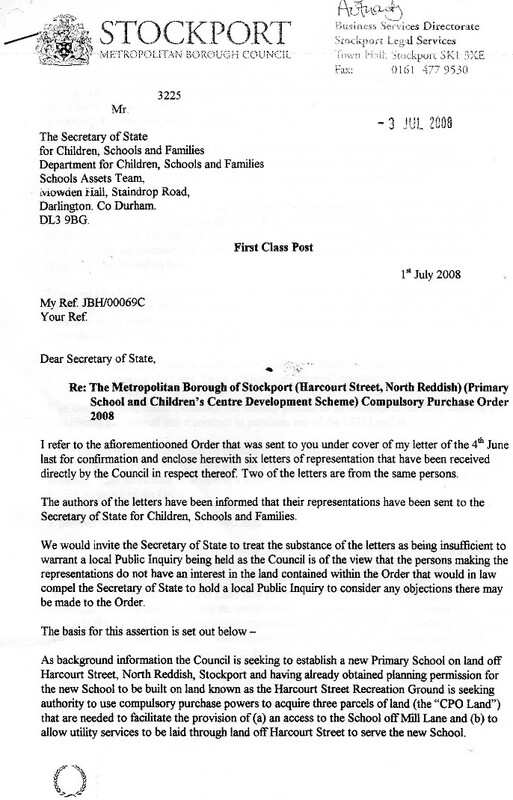 I think it would be premature for any action to be taken of the type described even if such action was necessary bearing in mind that the Council has yet to make a compulsory purchase order in respect of any land that may be needed to facilitate the development of the proposed School although I will let you know if and when such an order is made. Thank you for your acknowledgement. As I am sure you are aware, under the legislation quoted to the Executive Committee on 10th March 2008 the compulsory purchase cannot go ahead anyway if remediation measures are outstanding. The Environment Agency had heard nothing from Stockport Council regarding the further conditions they imposed as of the end of February. Greater Manchester Geological Unit had not been asked to carry out any further work as of the end of February. So, remediation work is outstanding. There are financial issues which are not clear, which also casts doubt on whether the the CPO process can continue according to my legal advice. Apparently, the Council plans to spend over £6 million in capital receipts to fund this project. With the collapse of the housing market, is this still a viable proposal? So, if the Council deals with the remediation measures, as it has to do in order to be in a position to apply for compulsory purchase, I can go through my village green application to run concurrently. It will not be holding the Council back in any way. Then the correct procedures will have been followed, and I think you vouchsafed to the Stockport Express that this would be the case. Finally, we have a very, very large number of statutory objectors to the CPO. It might be advisable if a meeting were to be arranged between you, Mrs. Penkethman, me and maybe the local MP to discuss these outstanding issues. Receipt of your e-mail is acknowledged. This email is to officially inform you that I shall be claiming a village green along the Poplar Tree stretch of the land at Mill Lane, North Reddish, Stockport. I believe the owner of the land is not known following my inquiries at the Land Registry. I have massive local support for this claim. The land has been used by local people as of right for many, many years for lawful sports and past times. An official confirmation of receipt of this email would be most appreciated. I am writing in response to your request for information below (ref 1202). 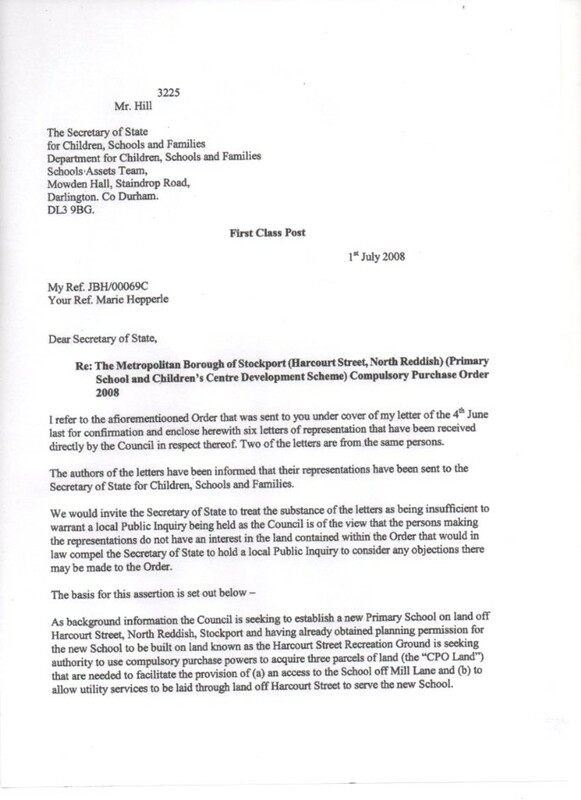 The Council sent the letters of objection to the DCSF in two separate mailings. One contained six objection letters; the other contained the remaining objection letters. This means there are two covering letters which fall within the scope of your request. Please find attached one of the covering letters. The second covering letter contains information which we consider to be subject to legal professional privilege, specifically, the category of ‘litigation privilege’. Under section 42 of the Freedom of Information Act 2000 (FOIA), this information is exempt which means we do not have to provide it to you. Section 42 is a qualified exemption which means we must carry out a public interest test. This means that we must consider whether or not the public interest in maintaining the exemption outweighs the public interest in disclosing the information, where ‘public interest’ refers to the wider public interests rather than what is interesting to the public. 1) There is an inherent public interest in the Council being transparent in its decision to promote accountability as this leads to improved decision-making. 2) It would enable the public to see that the Council is acting appropriately. 3) It would allow the public a deeper understanding enabling the community to participate more fully in the debate, which in turn enables the public to better understand the Council’s decisions. 1) As outlined by both the Information Commissioner and the Information Tribunal there is a very strong public interest in protecting the principle of privilege and the associated confidentiality. 2) There must be reasonable certainty that there will be no disclosure of such information. If this is not present, such communications will suffer and may not be as free and frank as they ought to be. 3) It is vital that the Council can obtain and use clear and frank legal advice so it can comply with the full remit of its legal obligations and conduct its business accordingly. By definition, legal advice will highlight strengths and weaknesses of a particular course of action. 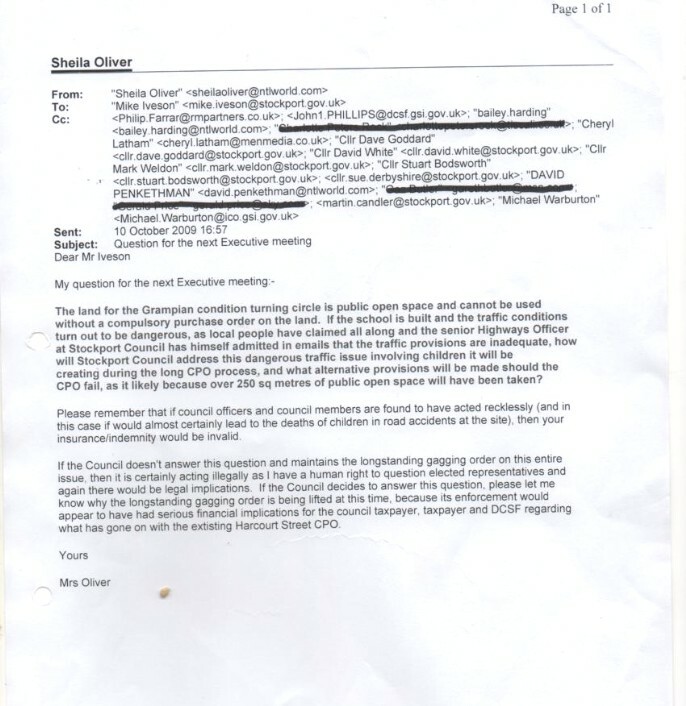 If such communications were disclosed on a regular basis it would lead to the Council becoming reluctant to seek and use such advice as its release may damage the Council’s position. If the Council were to become reluctant to use legal advice it would have a detrimental effect on the Council’s ability to carry out its public functions. 4) Where litigation is contemplated or ongoing, disclosure could undermine the prospects of success by the authority. In this case, particularly having regard to the timing of your request, the Council has concluded that the public interest lies in favour of withholding the information. With the above in mind, we have provided you with a redacted version of the covering letter with legally privileged information removed. Freedom of information decisions are not part of the political arena. FOI is therefore not my "area of responsibility ". As I'm sure you will agree it would be most inappropriate for politicians to make such decisions so please don't wait until the end of the week. 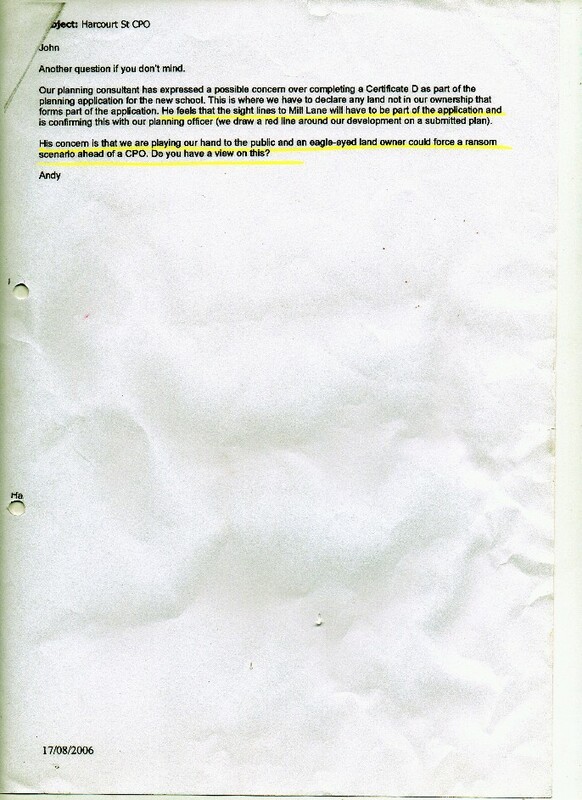 I notice you persist in your illegal action in withholding the Harcourt Street CPO background documents. 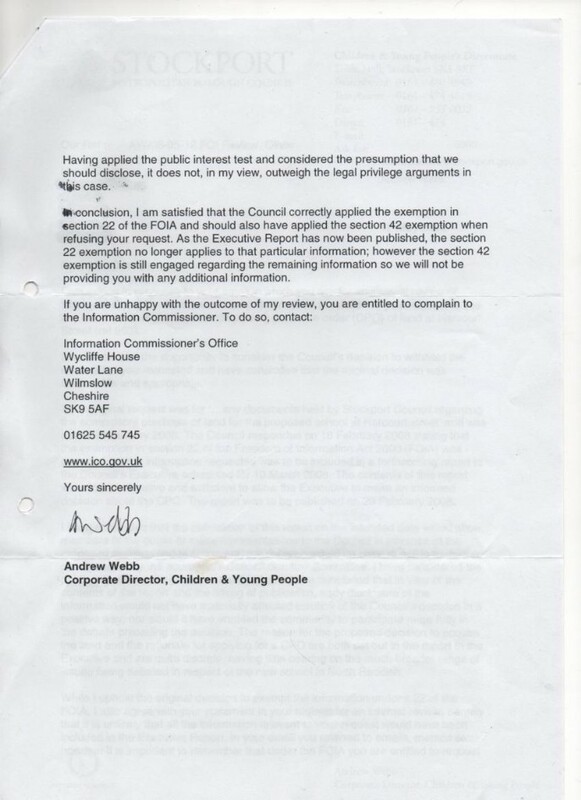 There can be no justification for withholding the background CPO documents, emails etc; this demonstrates the Council's wish for ridiculous and inappropriate levels of secrecy. Given today's press questioning and the public interest in the story, unless I am allowed to view all the documents by the end of this week, this matter shall be brought up in the local press. 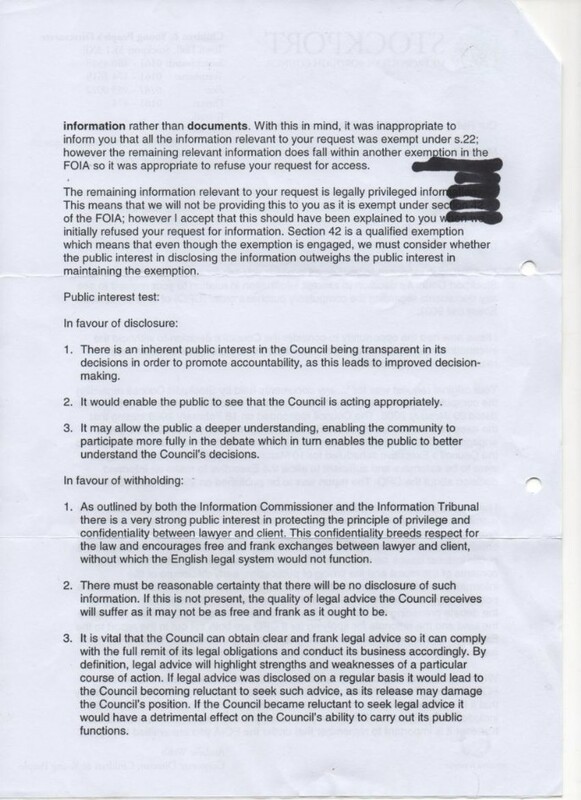 It is Cllr Weldon's area of responsibility; he purports to be all in favour of the FOIA. It will make him look a little bit (more) iffy in the run up to the local elections. Do we want that? No, we don't!